The Orbiting Solar Observatory (abbreviated OSO) Program was the name of a series of American space telescopes primarily intended to study the Sun, though they also included important non-solar experiments. Eight were launched successfully into Low Earth orbit by NASA between 1962 and 1975 using Delta rockets. Their primary mission was to observe an 11-year sun spot cycle in UV and X-ray spectra. The initial seven (OSO 1–7) were built by Ball Aerospace, then known as Ball Brothers Research Corporation (BBRC), in Boulder Colorado. OSO 8 was built by Hughes Space and Communications Company, in Culver City, California. The basic design of the entire series featured a rotating section, the "Wheel," to provide gyroscopic stability. A second section, the "Sail," was driven electrically against the Wheel's rotation, and stabilized to point at the Sun. The Sail carried pointed solar instruments, and also the array of solar photovoltaic cells which powered the spacecraft. The critical bearing between the Wheel and the Sail was a major feature of the design, as it had to operate smoothly for months in the hard vacuum of space without normal lubrication. It also carried both the power from the Sail and the data from the pointed solar instruments to the Wheel, where most of the spacecraft functions were located. Additional science instruments could also be located in the Wheel, generally looking out on a rotating radius vector which scanned the sky, and also across the Sun, every few seconds. OSO B suffered an incident during integration and checkout activities on 14 April 1964. The satellite was inside the Spin Test Facility at Cape Canaveral attached to the third stage of its Delta C booster when a technician accidentally ignited the booster through static electricity. The third-stage motor activated, launched itself and the satellite into the roof, and ricocheted into a corner of the facility until burning out. Three technicians were burned to death. The satellite, although damaged, was able to be repaired using a combination of prototype parts, spare flight parts and new components. 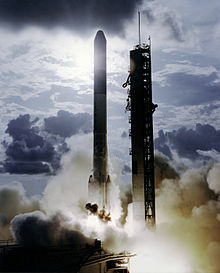 It was launched ten months later on 3 February 1965 and was designated OSO 2 on orbit. OSO C never made it to orbit. Liftoff took place on 25 August 1965 and all went well through the second stage burn. During the coasting phase prior to third stage separation, its rocket motor ignited prematurely. This registered on ground readouts as an attitude disturbance followed by loss of second stage telemetry, and although the third stage managed to separate itself, it suffered from an 18% drop in thrust. The OSO spacecraft could not attain orbital velocity and instead fell back into the atmosphere and burned up. The failure was suspected to have been caused by a modification to the igniter mechanism in the third stage after some minor technical difficulties experienced on the previous Delta C launch (TIROS 10 on 2 Jul). OSO 6 (OSO G) 9 August 1969 7 March 1981 Observed three instances of hard X-ray coincidences with gamma ray bursts. OSO 7 (OSO H) 29 September 1971 8 July 1974 Observed solar flares in the gamma ray spectrum. Collected data allowed for identification of Vela X-1 as a High-mass X-ray binary. OSO 8 (OSO I) 21 June 1975 8 July 1986 Found an iron emission line in the X-ray spectrum of a galaxy cluster. The Advanced Orbiting Solar Observatory (AOSO) program was developed in the mid 1960s as a more advanced version of the OSO series. Conceived as a polar-orbiting satellite system, these spacecraft would continuously monitor the Sun and surrounding environment with detectors and electronic imaging ranging from x-rays to visual light. Due to budget constraints, the AOSO program was cancelled in 1965. Instead, it was replaced by the OSO-I, OSO-J and OSO-K satellites. Only OSO-I, which became OSO 8, was ever launched. ^ Todd Neff (2010) From Jars to the Stars: How Ball Came to Build a Comet-Hunting Machine Denver, CO.: Earthview Media. ^ History of Orbiting Solar Observatory, OSO-2 (PDF) (Report). NASA / Goddard Space Flight Center. April 1966. N67-11368; TM X-55590. ^ Delta Vehicle Flight Failure Report, Launch 33 (PDF) (Report). NASA / Goddard Space Flight Center. October 1966. N67-40193; TM X-55988. ^ "Trajectory Details OSO 1". NASA. Retrieved 5 September 2014. ^ "Trajectory Details OSO 2". NASA. Retrieved 5 September 2014. ^ "Trajectory Details OSO 3". NASA. Retrieved 5 September 2014. ^ "The Third Orbiting Solar Observatory". NASA's Imagine the Universe!. NASA. Retrieved 5 September 2014. ^ "WATCH TO BE KEPT ON SUN". The Canberra Times. 41, (11, 627). Australian Capital Territory, Australia. 3 March 1967. p. 4. Retrieved 3 April 2019 – via National Library of Australia. ^ "Trajectory Details OSO 4". NASA. Retrieved 5 September 2014. ^ "Trajectory Details OSO 5". NASA. Retrieved 5 September 2014. ^ "The Fifth Orbiting Solar Observatory". NASA's Imagine the Universe!. NASA. Retrieved 5 September 2014. ^ "Safeguard for spacemen". The Canberra Times. 43, (12, 217). Australian Capital Territory, Australia. 24 January 1969. p. 7. Retrieved 3 April 2019 – via National Library of Australia. ^ "Trajectory Details OSO 6". NASA. Retrieved 5 September 2014. ^ "The Sixth Orbiting Solar Observatory". NASA's Imagine the Universe!. NASA. Retrieved 5 September 2014. ^ "Trajectory Details OSO 7". NASA. Retrieved 5 September 2014. ^ "The Seventh Orbiting Solar Observatory". NASA's Imagine the Universe!. NASA. Retrieved 5 September 2014. ^ "IN BRIEF". The Canberra Times. 47, (13, 243). Australian Capital Territory, Australia. 2 October 1972. p. 4. Retrieved 3 April 2019 – via National Library of Australia. ^ "Trajectory Details OSO 8". NASA. Retrieved 5 September 2014. ^ "The Eighth Orbiting Solar Observatory". NASA's Imagine the Universe!. NASA. Retrieved 5 September 2014. ^ "Advanced OSO". NASA - NSSDC - Spacecraft - Details. NASA. Retrieved 5 September 2014. This page was last edited on 3 April 2019, at 01:42 (UTC).